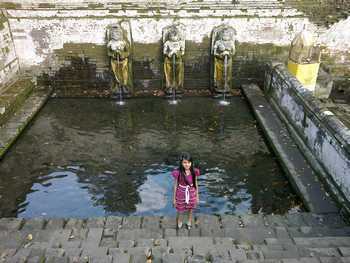 Goa Gajah or "Elephant Cave", located in the western village of Bedulu, Blahbatuh district, Gianyar, Bali. If taken from the city of Denpasar, the distance is about 27 km, with a travel time of about an hour, if not stuck in traffic. Because this time, the path to the Elephant Cave highly congested by vehicles, from anywhere. 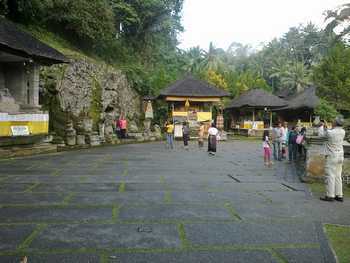 When I get there, from the city of Denpasar, it takes about 1.5 hours. Due to heavy traffic on the road to get there. Gua Gajah or foreign tourists often call it the "Elephant Cave", located in the village of my grandfather's birthplace. When my grandfather was a kid, he used to graze his cattle in the Elephant Cave. At that time, the Elephant Cave is not as busy now. My grandfather cheer, formerly used as the region's tourism industry, there are full of large trees. There are many rice fields. But now, it is very crowded, because of the development that became a tourist destination. 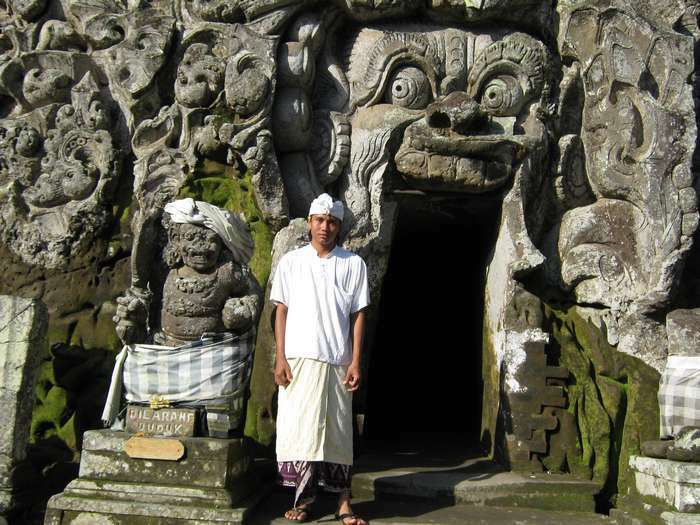 Based on the story of his grandfather, Goa Gajah name comes from the word "Lwa" and "Gajah". Which is the place to be imprisoned priests. Words Lwa, or Lwah (Loh), meaning river. So at first, the name has a meaning hermitage located on the river, the Gajah river, or in Gajah water, and a hermitage for pastors who worship the god of Shiva. Upon entering the tourist area of ​​Elephant Cave, there is a very wide car park, which is surrounded by stalls selling souvenirs and food fresh. Elephant Cave is located at the bottom of the cliff. We have to go through the steps, to go down to the court of the cave. Not much, only about 50 yards from the parking area. If the local people who came there, with the goal of worship, will not be charged admission. If a tourist, entry fee for Rp.15000 for local tourists, and Rp. 30 000 for foreign tourists. The atmosphere in the court of Goa Gajah (Elephant Cave) is very comfortable, with fresh air, surrounded by large trees and shade. The region includes the plantation. There are two ponds in front of the cave. Previously, since the Elephant Cave made, swimming baths is king. Adjacent to the eastern area of ​​the cave, there is a large river, its water is very clear and cool. The river is used as a place for bathing and drinking water for people living in the region. Hopefully this situation is maintained forever. Cave is unique, because the walls cave in chisel resemble a human face, with eyes turning to right, but creepy. The width and height of the cave holes just for two people only. On the left and right side of the cave decorated with two statues. The statue is as if keeping the side of the cave. We are not allowed to occupy the statue. Do not also touch the head of the statue. For the sake of the sanctity of the statue, and not until something happens to us after doing things forbidden to the statue. Upon entering the cave, the situation is very dark inside. Along the side of the cave there are small holes. It is estimated these holes is imprisoned. Hole cave from the outside until the end of the cave, has a length of approximately 30 meters. Shaped "T" at the end of the cave. When it reaches the end of the Elephant Cave, in the eastern part of the cave, there are three Linga, lined up in one place. Each Linga, surrounded by eight small phallus. In Hindu tradition, it is Linga shrine, a symbol of worship of Lord Shiva, as a manifestation of God. 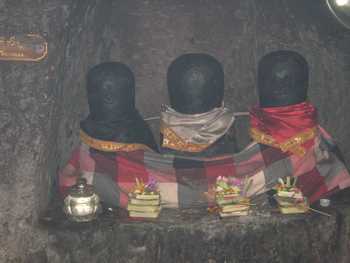 Three Linga is probably a relic of one of the Hindu sect of Siwa Pasupata. Elephant Cave hand the other end, there is a statue of the elephant-headed, that statue of Ganesha. For the Hindus, Lord Ganesh is the god of science. Apart from being a tourist destination, Elephant Cave is also a temple and often called Elephant Cave Temple. I came when it was held the ceremony. That temple ceremony at the Temple Elephant Cave.